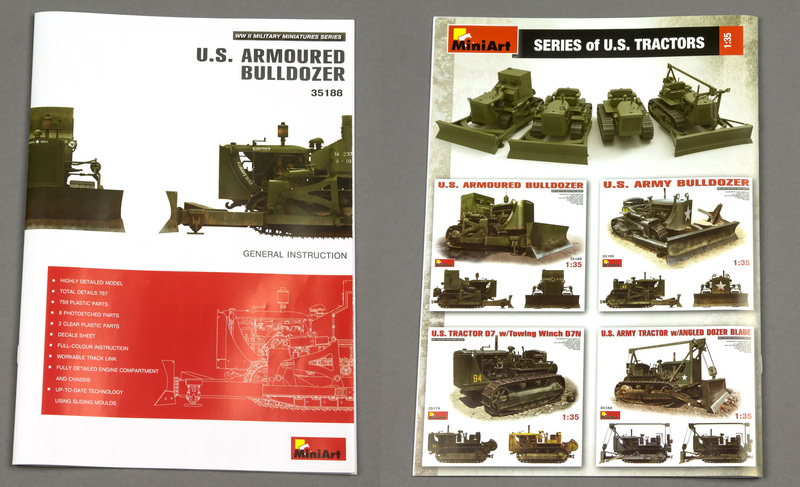 The Modelling News: In-Boxed: Andy checks out MiniArt’s up-armoured Bulldozer in 35th scale. Cheapest we could find: $USD 38 from HobbyEasy. 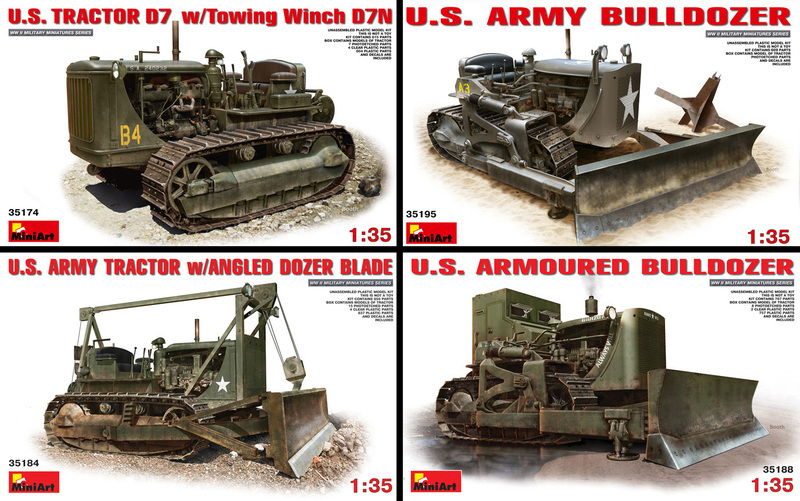 MiniArt have never been a company to shy away from left field subjects. While some manufacturers are content to bring us yet another Tiger, Panther or Sherman, MiniArt have given us Soviet buses, German Fire Trucks and lots of other “behind the lines” vehicles that are often far more interesting than their more famous front line counterparts. I've always been a sucker for these unsung heroes of the battlefield, and MiniArt's new line of Caterpillar bulldozers fits that mould perfectly. 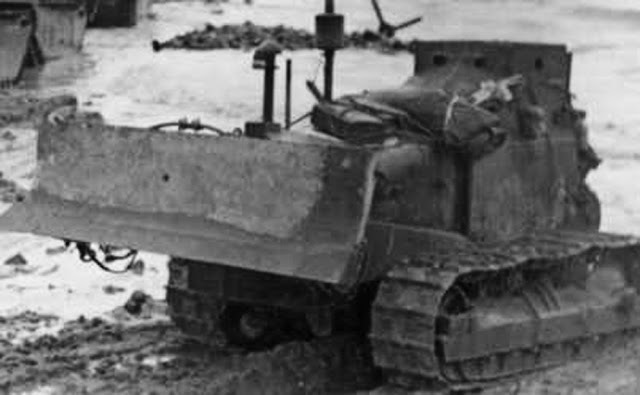 The D7 tractor was an unglamorous, but essential presence on the battlefield, clearing a path through debris and destroyed vehicles, to allow troops and heavy armour to advance. 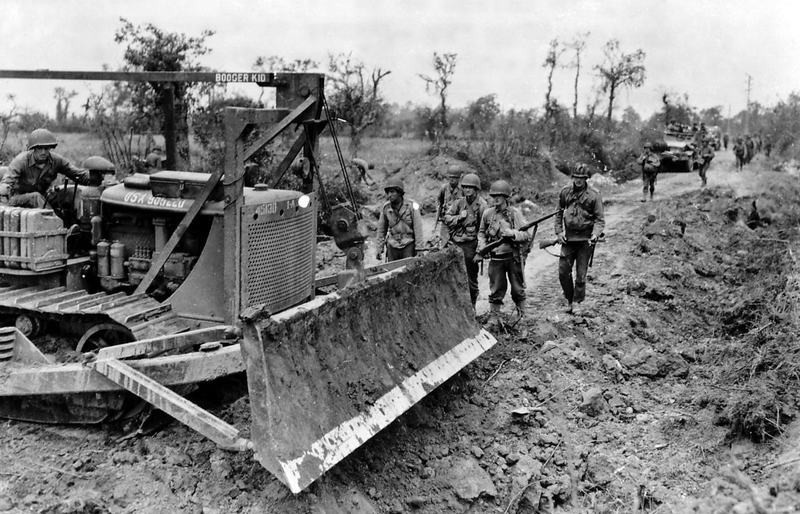 They saw widespread use during the war, but really came into their own during the D-Day invasion, helping to clear the French beaches and roads of obstacles. 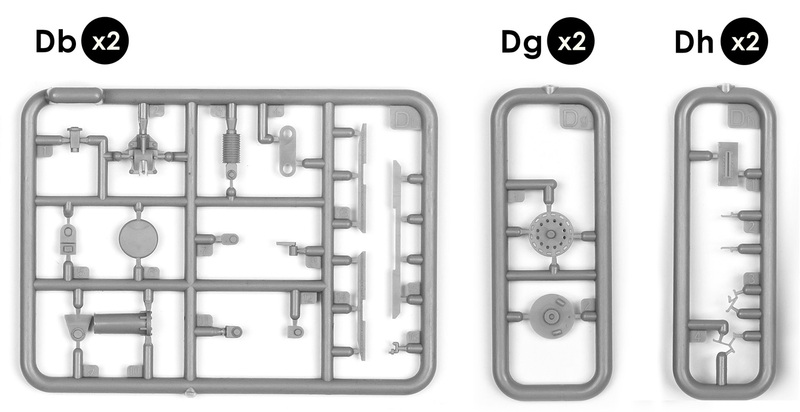 MiniArt have released four versions of the D7, all built on the same basic chassis, but all with a distinctly different look. The one we're looking at here is the armoured cab version. 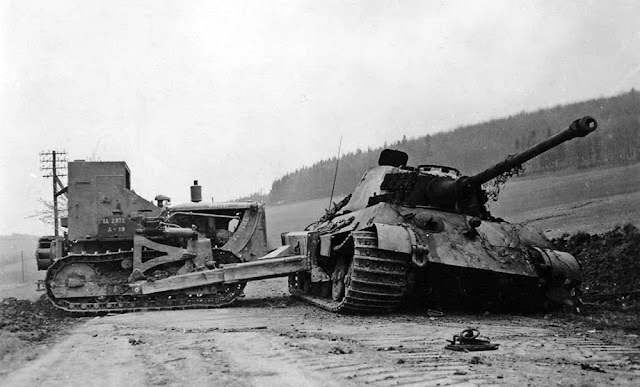 This would have been a pretty essential modification while operating in a hostile environment, where German snipers would be taking pot shots at you, while you were trying to clear a road. The heavy armoured cab certainly gives the D7 a very menacing and purposeful look. From past experience with MiniArt's kits, I was expecting a lot of plastic to be squeezed into the box, and I wasn't disappointed on that score. 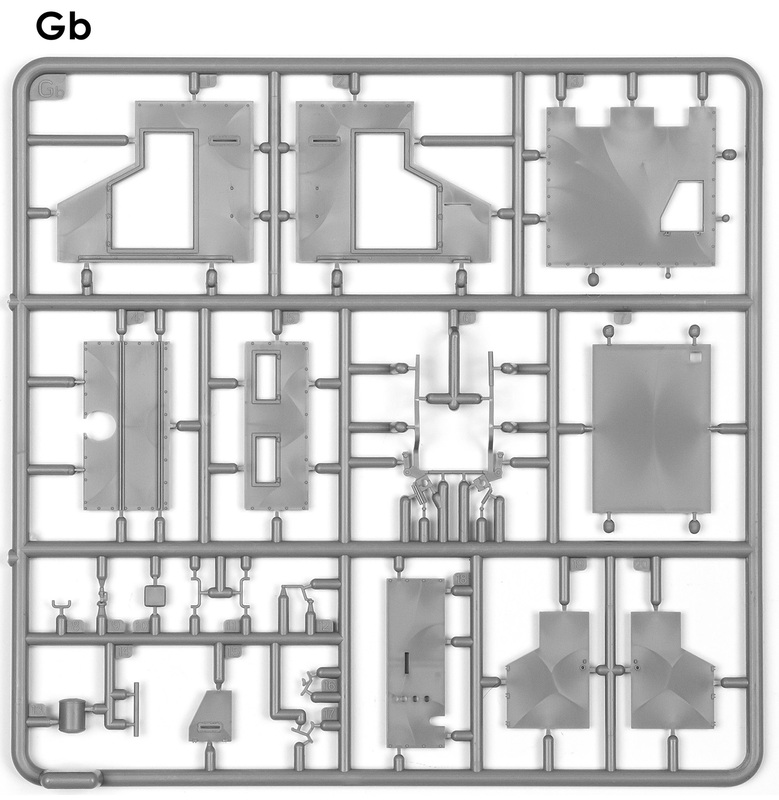 With 767 parts spread across 30 sprues, plus a small P.E. Fret, this will certainly be an involved build. The plastic's been moulded in a medium grey and, although some of the sprues exhibit a little flash, the parts themselves look clean with good detail. Many of those parts are very small and a good deal of care will be needed when removing them from the sprue. In fact, one of the hydraulic lines was already broken on my example, so be extra careful when removing the sprues from the cellophane bags they come in, to avoid catching fragile parts. 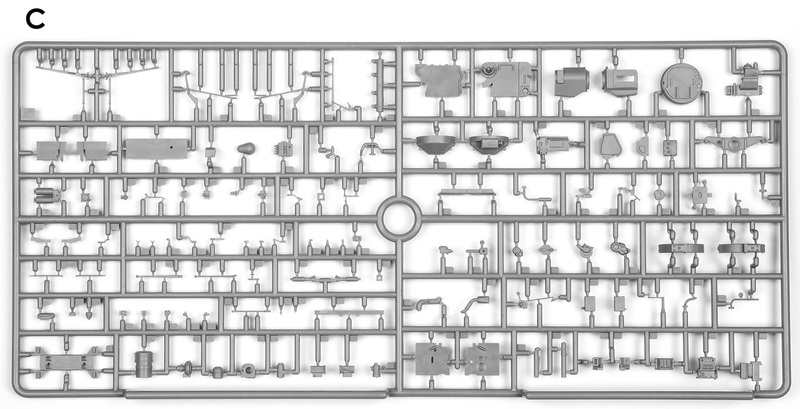 There are a lot of parts to get through, so let’s get started with a quick look at the sprues, before we take a closer look at the details. 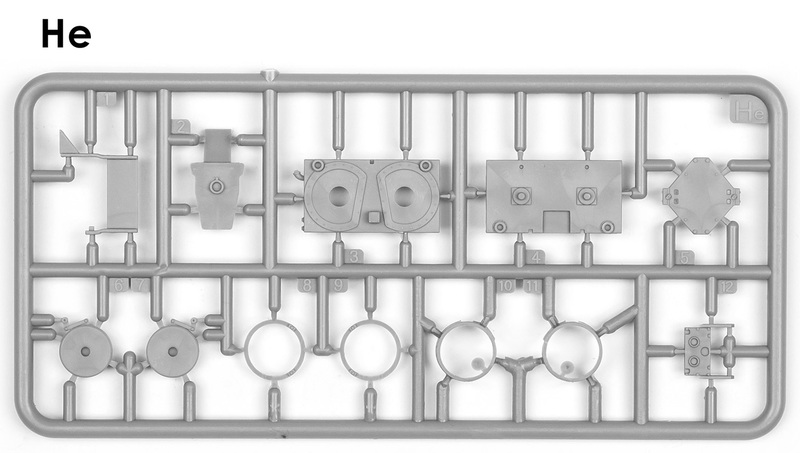 In addition to the main sprues, you get one clear sprue for the headlight lenses, only two of which are needed, giving you two more for the spares box (always useful, for models that don't include clear lenses). You also get a small P.E. Fret and finally, the decal sheet. In addition to the US stars and other external marking, this also includes instrument dials and some placards for the engine and gearbox. The instruction manual is in an A4 portrait format which should prop up nicely at the back of your work bench. The rear cover shows the other versions of the D7 available. The build steps are clearly drawn and labelled, but the sheer number of parts means there's quite lot going on in each step, so pay extra attention to ensure you don't miss something. Construction of the engine block covers the first 17 steps alone. This build will keep you busy for quite a while. In all, there are 80 build steps, the final one being the attachment of the main dozer blade. A full colour 5-view painting guide is provided, and it's a case of “any colour you like as long as it's olive drab”. Just the one marking option, but at least it's for a named vehicle, which will give it a little more personality. The colour call-outs are for AMMO paints but, as seems to be increasingly common these days, there's no colour info provided for detail painting during the build, so you'll need to check references for that. So now let’s have a closer look at some of the more interesting details in the kit. Construction starts with the engine, so we'll look at those parts first. The main block has some lovely detail on it, including the CATERPILLAR branding. There are A LOT of parts that go in to the engine (I haven't counted, but I'd guess it's well over 100), so this will be a time consuming part of the build. The finished engine should be well worth the effort though. The radiator and grill are also beautifully detailed. A panel line wash will really bring out the texture on the grill. The side covers for the engine bay also feature the CATERPILLAR and D7 branding. Normally manufacturers tend to avoid brand names because of licensing issues, but MiniArt seem to have got round the problem. Moving on to the cab, we get some sharp tread plate detail for the floor. Not much of this will be seen of the armoured cab version, but it should enhance the look of the other models in the range. The seat pad has some subtle creases and maybe a hint of texture, although it's hard to tell if that's intentional. Again, this is more relevant to the open cab versions. The armoured cab itself comes as a flat pack, which is built up separately, before being dropped into place on the cab floor. The doors and forward vision hatches can be modelled open, which will at least give a glimpse into the interior. 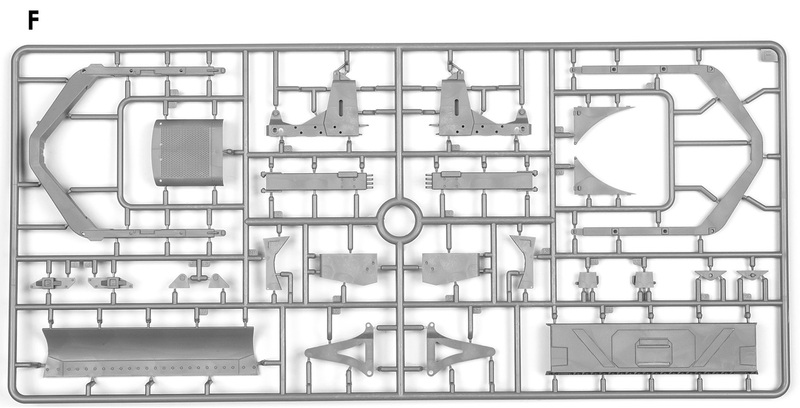 The tracks are described as fully workable, with each link being made up of a single piece track plate and two connecting plates, and are linked together by pins which need to be kept free of glue during assembly to ensure the tracks remain articulated. Fortunately, they aren't long runs, with only 36 links per side, so construction shouldn't be too laborious. These are nice. Two beautifully moulded, hollow coil springs, which go on the main frame for the dozer blade. After glancing through the instruction manual, I initially thought that moulded cables were supplied for the two winches on the rear of the tractor, but sadly not. The star symbols next to the two cables indicate parts you have to supply yourself. 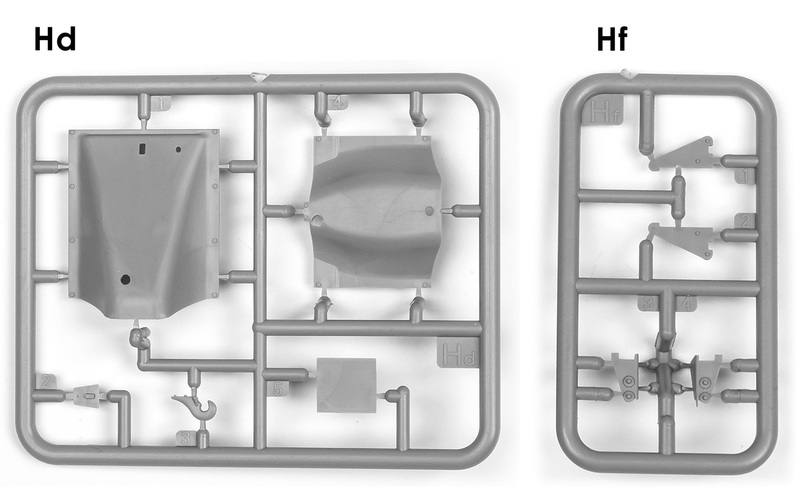 Part 1 on sprue H (what I assume is a hydraulic line) is meant to come in three pieces, so don't assume yours is broken. Unfortunately, mine was in more than three pieces and was definitely broken, having been slightly crushed in the box. Hopefully it should be relatively easy to repair. Apart from that one broken part, the only other issue I've found was on the same sprue H. Part 3 (the box that the hydraulic line attach to) was badly moulded and appeared to have partially melted. Presumably this happened during the moulding process, but it's odd that it's only affected this one part. Some of the damaged area will be covered with other parts, but some remedial work will be necessary. Hopefully these issues are restricted to this example. 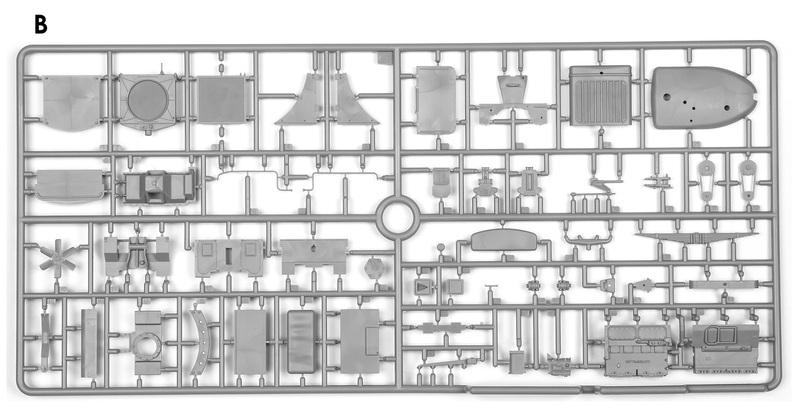 So, what are the impressions of this new kit from MiniArt. Well, it's certainly going to be a complex build, the sheer number of tiny parts ensures that. But from my previous experience of MiniArt kits, as long as the parts are cleaned up and dry fitted before gluing, everything should go together relatively well. Having said that, this isn't going to be a quick build. It's definitely one to take your time with, but the end result should be a fantastically detailed model. 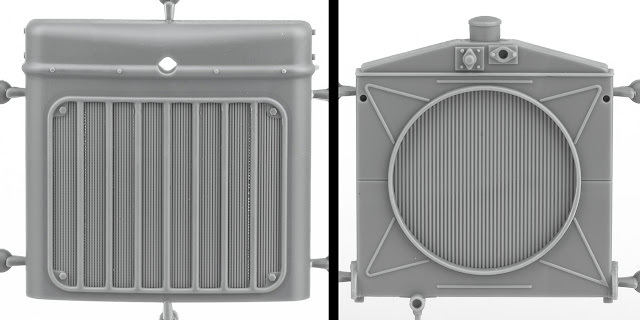 It will also be a very versatile model, and could be incorporated into a diorama, either on its own or with another vehicle, or could simply be a display piece in its own right. If you looking for a challenging build that you can enjoy over a few weeks (or months), then this comes highly recommended. Available from MiniArt’s Distributors Worldwide - Thanks to Miniart for sending us this kit to review and build.